Do you guys listen to podcasts? In the past few months, I've become a huge podcast fan. It's become my go-to activity (often replacing reading, sadly) to do on public transportation, in the car, when I'm putting on my makeup, or when I'm just walking around town. My favorite podcasts are the ones that feel like a good Netflix binge in the sense that it's almost impossible not to go right into the next episode. And since I'm always looking for new ones, I figured you might be, too. So, below, I've gathered my four current favorites. Whether you're an avid listener or just looking for something new to try after discovering S-Town (which I have very mixed feelings about, BTW), here's four truly amazing podcasts to download right now. • In the Dark: In 1989, 11-year-old Jacob Wetterling, his brother, and a friend were accosted by a stranger on a dark road in their rural Minnesota town. Jacob was taken by the man; the other boys were told to run for their lives. After that night, Jacob was never seen again. It was a terrifying crime, but no one was ever arrested--that is, until a week before this podcast (which just happened to be reopening the Wetterling case) aired, when a man finally confessed. You might think that would have put a dent into the story, but it didn't at all. Using interviews with key players in the case (the parents, neighbors, other possible victims) and actual videos and news footage from the time (it's chilling when you hear Jacob's friends and brothers decribe witnessing the kidnapping), the podcast looks back at the many mistakes the police department made in nearly every step of the investigation. It's heart-wrenching, scary, and all in all, an amazing story. • Up and Vanished: 12 years ago, Tara Grinstead, a beloved teacher and former beauty queen, left a party a few blocks from home in her small Georgia town--and was never seen again. In this riveting podcast, a filmmaker re-investigates the case, looking at every angle from the shady ex-boyfriend to the younger ex-student she had dated to the possibility of a police coverup. What's really cool is that the story is told in real time (he recorded an episode each week as the investigation proceeded), so the podcast has many twists, turns, and surprises--including a HUGE one about halfway through. • Missing Richard Simmons: In February 2014, Richard Simmons abruptly disappeared. He stopped teaching classes at his fitness studio. He ended contact with lifelong friends. He made no public appearances. He wouldn't even answer the phone. He had suddenly and effectively vanished. This podcast follows one of Richard's friends who is trying to figure out what happened. Is Richard depressed and suicidal? Is he sick? Transitioning into a woman? Controlled by his housekeeper who might also possibly be a witch? Is he even still alive? The search for these answers is fascinating, mesmerizing, and sad. • Pod Save America: This one isn't true crime, but it's awesome. I eagerly await the episodes each week, listening to them the second they hit my phone. But first, big disclaimer: If you are a Trump fan, it's not for you. But if you are absolutely horrified by him, you'll love it. 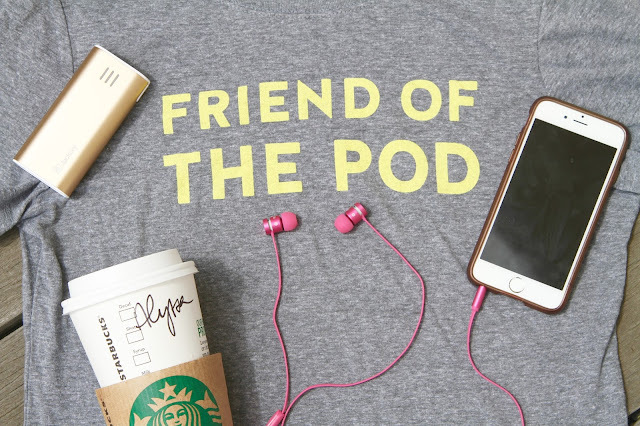 I'm a total junkie, myself--a "Friend of the Pod," if you will. First, it's absolutely hilarious. While I'm listening to this podcast, I often find myself cracking up while walking down the sidewalk (and thus, looking like a total idiot!). It's also educational. When you're a regular listener, you'll feel smarter and much more informed about the world, politics, and current events. Start here with the original podcast, and then if you like it, you can move on to its sister shows like Pod Save The World and Lovett or Leave It. Now tell me your favorite podcasts! What are you listening to--and loving--right now? I'm always looking for new shows to download. And have you already listened to any of the four I mentioned? If so, thoughts? I am dying to this to that In The Dark podcast now! I love stuff like that. Ooooooh you've tickled my fancy. Especially the Richard Simmons one. Now I need to know what's happening with him! If you're into random history facts, "Stuff you missed in history class" is excellent. The episodes are 30ish mins, twice a week. It's been on for years, so there's plenty that you can pick and chose which subjects you'd like to listen too. The mum 2.0 conference seems like a fun place to be for moms. When is the next conference? Would be a perfect mothers day activity for my mom next year.